Popular HBO fantasy series Game of Thrones has quickly reached cult status. When you think about its viewership, it seems absurd that anyone hasn’t at least seen part of the series, if not all of it. But in certain scenarios, some fans are taking their obsessions a little too far. This time around a super fan has decided to use what he learned in the series at his day-to-day job. And things become even more ridiculous when you realize he is an attorney demanding a literal battle to the death. The Staten Island lawyer, Richard A. Luthmann is channeling his inner Game of Thrones in a recent case, asking a judge to sanction a trial by combat to resolve a civil suit. The allegations made by plaintiffs, aided and abetted by their counsel, border upon the criminal. As such, the undersigned (Luthmann) respectfully requests that the court permit the undersigned to dispatch plaintiffs and their counsel to the Divine Providence of the Maker for Him to exact His divine judgment once the undersigned has released the souls of the plaintiffs and their counsel from their corporeal bodies, personally and or by way of a champion. In the event that this case is not dismissed, Luthmann seeks trial by combat. And as we’ve seen in Game of Thrones this can take place by either the disputant or a stand-in. In his request, Luthmann details the history of trial by combat including how it was never banned by the Constitution in the U.S. or in the state of NY. The lawyer has acknowledged that this move could hurt his career, and that the judge may not be happy with this request, but he is prepared to take it to the highest level, as a right under the constitution. 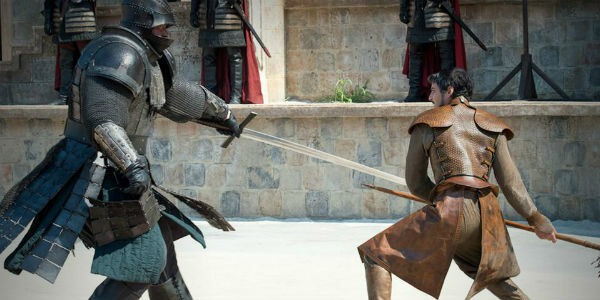 The guy may sound crazy, but detailing the history of trial by combat in over 10 pages is not a task to be taken lightly. Luthmann sounds serious about his request, and we’ll just have to see how far this match goes. Can you imagine an event like this actually taking place today? Hopefully it doesn’t end quite as graphically as that Game of Thrones scene.